A Thirteen-Year Overview of Inventory Levels- Where’s the Balance? 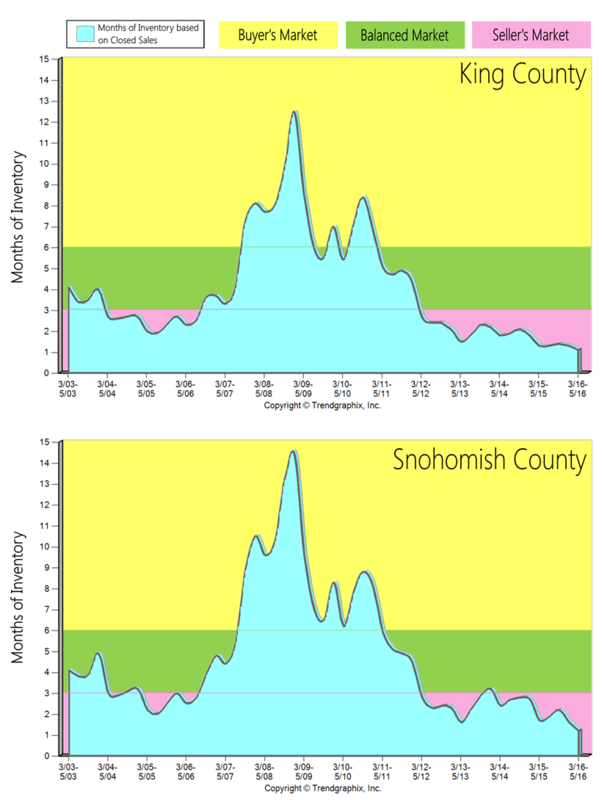 The two graphs here illustrate a thirteen-year overview of inventory levels in both King and Snohomish Counties, highlighting the 2007 crash. Inventory levels are measured by the months of available inventory. For example, if there were 60 homes available in July and 30 homes sold in July, you would be left with two months of inventory; meaning that if no new homes came to market, the demand of 30 homes per month would absorb the 60 available homes in two months. A buyer's market is defined by 6+ months of inventory, a balanced market, 3-6 months and a seller's market, 0-3 months. From March to June of this year we averaged 1.1 months of inventory in King County and 1.2 months in Snohomish County, both extreme seller's markets. In King County over the last 13 years we saw three years of a buyer's market, which happened during the biggest economic downturn since the Great Depression, after the crash of the housing market in 2007. This economic fallout was a result of predatory lending practices, which created a large population of buyers who were not truly qualified to purchase a home. This oversaturated the market and then led it to its crash when those lending practices were shut down. These severe influences on the market led to quick jumps from a seller's to a buyer's market and then a buyer's to a seller's market. It only took one short year to transition from the seller's market of 2004-2006 to the three-year long buyer's market after the housing crash. Once the sub-prime lending options were shut down in July 2007, it eliminated many buyers, creating an extreme buyer's market. It also only took one short year to transition out of the downturn and back to a seller's market as the economy started to recover. It has been a seller's market in King County since May of 2012 – four years! In Snohomish County over the last 13 years we saw four years of a buyer's market. Snohomish County was hit a bit harder by the Great Recession than our neighbor to the south, as it took longer to recover. It has been a seller's market in Snohomish County since May of 2012, except for one quarter of a balanced market in the beginning of 2014, when we saw a surge of new construction come to market due to the national builders releasing some neighborhoods they had acquired in the downturn. Interestingly, the market shifts were brief because the downturn was so severe, which changed the market environment quickly. In order to clean up the predatory lending mistakes of 2004-2007, the market essentially had to come to a standstill and flush out all of the bad loans via foreclosure and short sales, which took five years. The only time we found ourselves in such an extreme buyer's market, was after one of the biggest economic fallouts of the last century. Once that corrected itself we quickly returned to a seller's market due to many positive factors. Our available housing stock is affected by the limited land left to build on, a thriving job sector (especially in tech), historically low interest rates and the Greater Seattle area being a nice place to live. All four of these indicators have shrunk inventory and put upward pressure on prices. Sellers continue to enjoy great market returns, and buyers continue to fight to secure a home with a 4% interest rate, and not too far from their workplace. Additional inventory would be more than welcomed, it is very clear that we have the demand to absorb it. If you are curious about the value of your home in today's market or securing a purchase please contact one of our agents. We are always happy to help educate you on how this market can benefit your bottom line.